Appointment of Apostolic Administrator Sede vacante of the Diocese of Amravati. Sub: Appointment of Apostolic Administrator Sede vacante of the Diocese of Amravati. In the light of the Communication received from the Apostolic Nunciature, I wish to inform you that with decree Number 427/19, dated 27th January 2019, the Congregation for the Evangelization of Peoples appointed His Grace Most Rev. 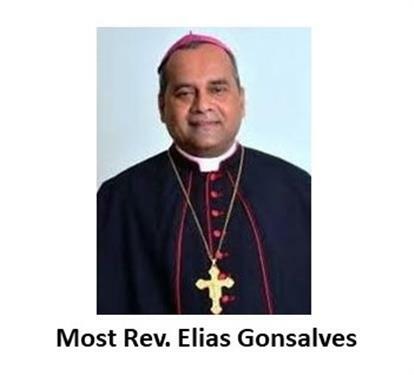 Elias Gonsalves, Archbishop of Nagpur, as Apostolic Administrator Sede Vacante of the Diocese of Amravati. Let us entrust to the intercession of the Virgin Mary the Episcopal ministry of the Apostolic Administrator.